The Viking Designer SE is quite possibly the most advanced home embroidery machine available. The largest LCD screen on any machine greets you. Rows of long lasting diodes light up with an optimum setting. Your view of sewing and embroidery will change forever. 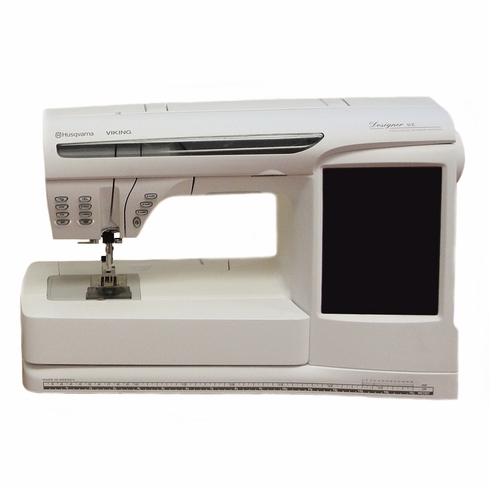 The Designer SE features the very latest features that will expand your creativity and enhance the joy of sewing. It has two built in advisors, one for sewing and one for embroidery. There are two USB ports to connect computers and accessories. You will find impressive interactive 3D embroidery capabilities. This newest invention from Sweden's Husqvarna Viking was created from your sewing desires. The built in flexibility and adaptability will provide joy for years to come. Includes Standard (100 x 100mm) and Large (240 x 150mm) Embroidery Hoops and most original feet.